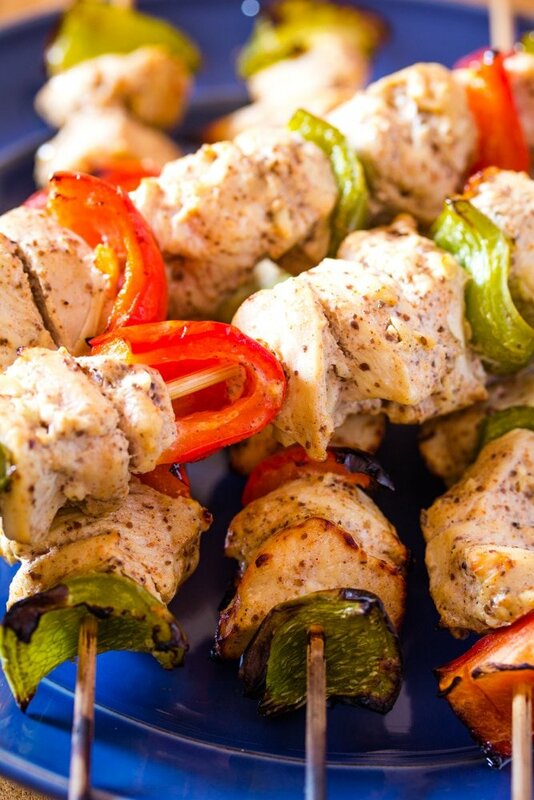 Shish Tawook or Shish Taouk is a popular Middle Eastern chicken recipe which is found at most fast food restaurants in the Middle East. 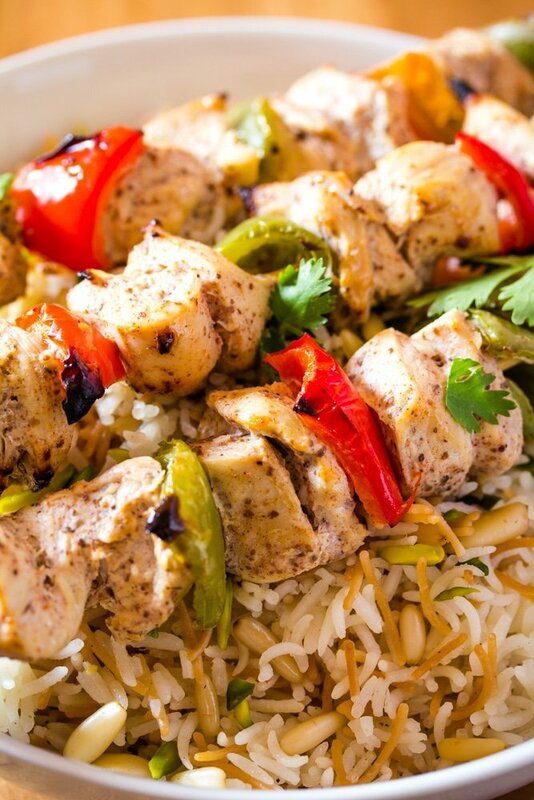 The name Shish Tawook quite literally translates to grilled chicken on skewers. It is mostly served with pita bread, but I think it also pairs quite nicely with this simple and delicious Lebanese Rice Pilaf. I’m in love with Middle Eastern recipes these days, so if you love Middle Eastern cuisine check out this recipe for Falafel as well! So after the delicious Lebanese Rice I posted on Monday, I’m here with another popular Middle Eastern fast food: Shish Tawook (aka Shish Taouk). Shish Tawook is SO popular in the Middle East that it’s even sold in the frozen aisle in grocery stores here. 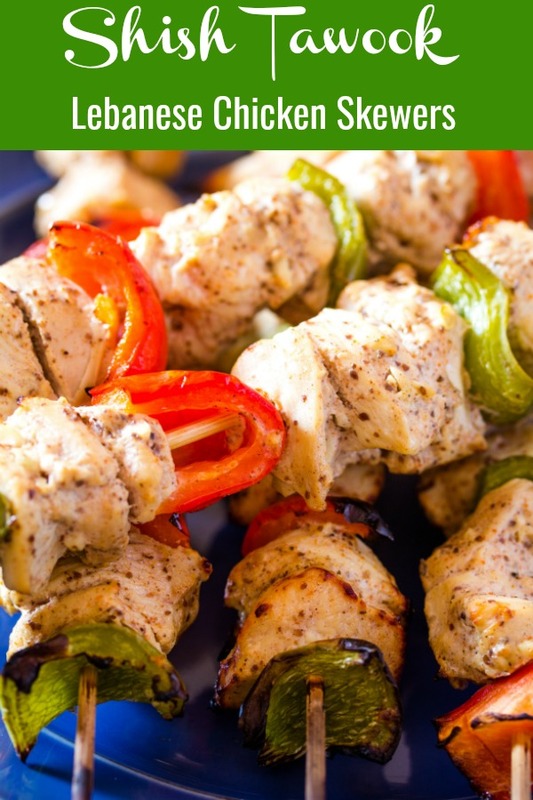 But no need to go for the frozen option, when you can make delicious Shish Tawook recipe at home! What Does Shish Tawook mean? In Turkish the word Shish means skewer. And the word Tawook is derived from tavuk which means chicken. So quite literally, Shish Tawook means Chicken Skewers. How do you make Shish Tawook or Taouk in the Oven? 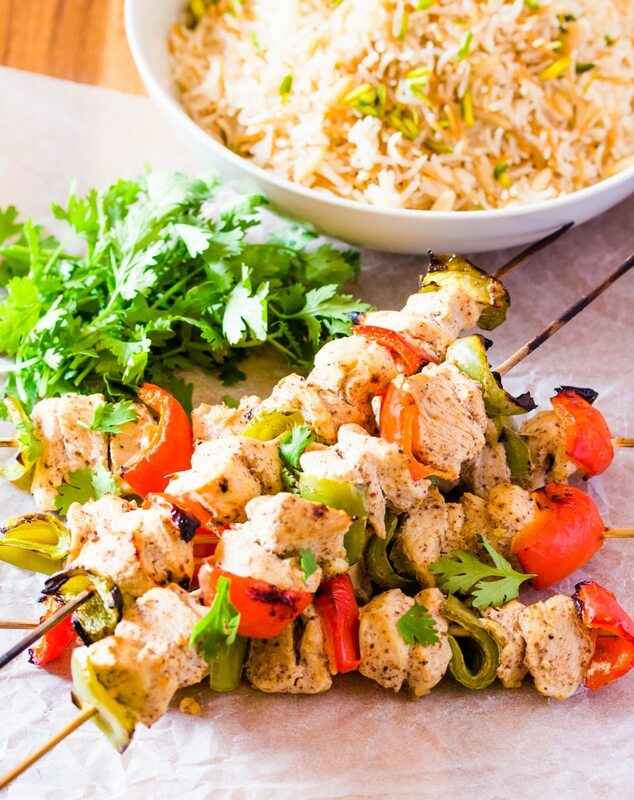 There are several ways to prepare Shish Tawook, but the most common is to thread the marinated chicken pieces onto wooden skewers and then either grill or bake in the oven. And this is the method I’m using in today’s post for this divine yogurt marinated Lebanese chicken. However, I’ve made this Shish Tawook in the skillet without skewers and it cooks up beautifully that way too. So it’s really up to you, how to cook it. I’ve added instructions for both cooking methods in the recipe card. What Ingredients do I need for Shish Tawook? There aren’t many ingredients that you need for Shish Tawook and most of them are easily available in your pantry. The lemon and yogurt act as tenderizers and so I recommend marinating the shish taouk for at least 30 minutes or up to 24 hours. The longer the chicken is marinated in yogurt, lemon and garlic and sumac, the more flavourful and juicy it will be. What is Sumac Spice and Where Can I Find it? Sumac spice is derived from red berries that are native to the Middle Eastern region. They’re dried and ground into a coarse powder. Sumac is a beautiful deep maroon color, and has a tangy lemon flavor. Sumac is not spicy at all by the way. I think Sumac should be available at most big grocery stores, but of course it must be easily available in Middle Eastern stores too. You can also buy it here. How to Make Shish Tawook? 1.) We start by marinating the chicken in yogurt, lemon juice, garlic and spices. Marinate for at least 30 minutes, or up to 24 hours. Longer is better. 2.) Chop the bell peppers into 1 inch cubes while the chicken marinates. 3.) Soak the wooden skewers in water so that they don’t burn in the oven. 4.) 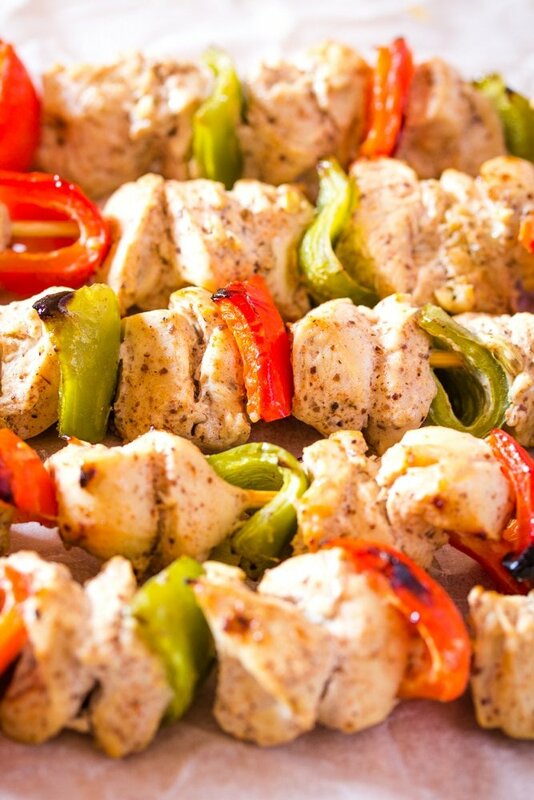 Thread the chicken and bell peppers onto the wooden skewers and bake in the oven. 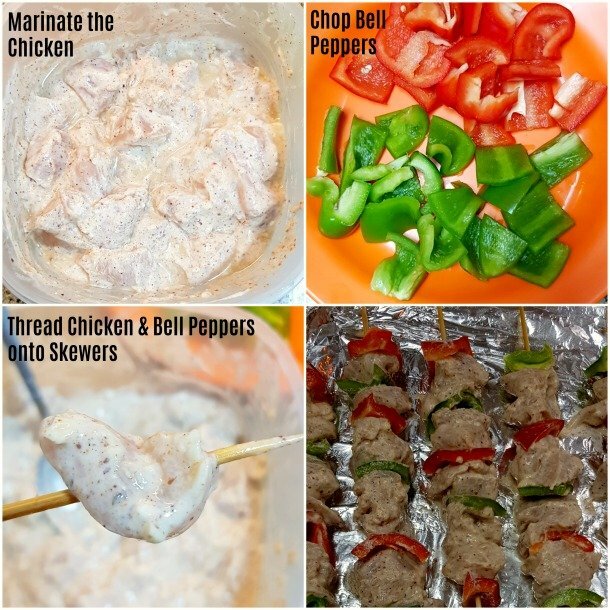 To avoid the chicken falling off the wooden skewers, thread each piece twice onto the skewer, as shown in the step by step photos below. How is Shish Tawook Served? 1.) As a Shish Tawook Plate: So the Shish Tawook is served with rice, salad, pickled vegetables and French fries. I’ve made this Shish Tawook several times in the past few weeks, and I’ve always served it with this delicious Lebanese Rice Pilaf and Greek Salad. 2.) As a Shish Tawook Sandwich: Served on pita bread topped with salad and French fries. I do hope you try out this delicious Shish Taouk, it’s really a lovely and easy meal that’s perfect for weeknights! 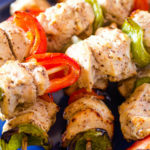 Shish Tawook or Shish Taouk is a popular Middle Eastern chicken recipe which is found at most fast food restaurants in the Middle East. 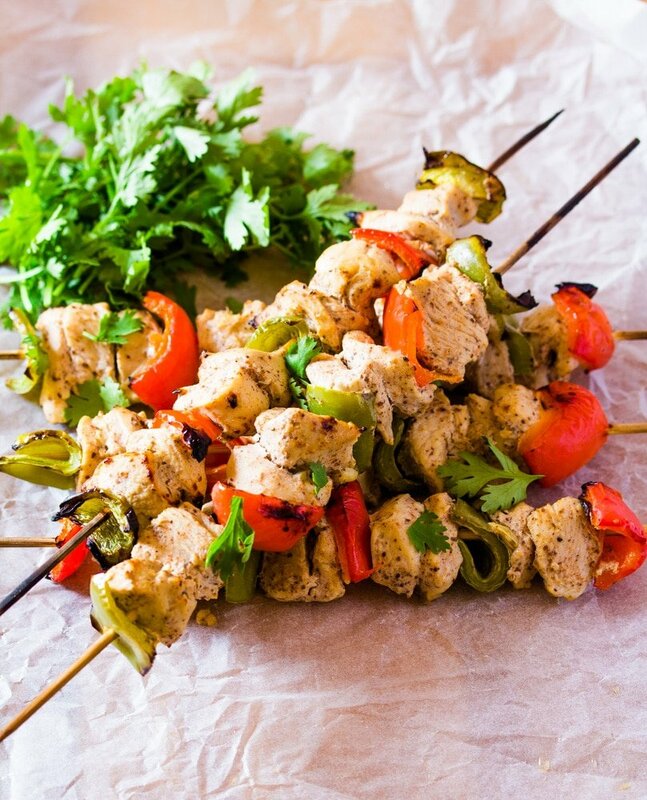 The name Shish Tawook quite literally translates to grilled chicken on skewers. It is mostly served with pita bread, but I think it also pairs quite nicely with a simple and delicious Lebanese Rice. Place all the ingredient in a medium mixing bowl (except for the bell peppers) and mix so that the chicken is coated well. Marinate for at least 30 minutes or uptown 24 hours. When ready to bake, preheat the oven to 200 C and prepare a baking tray by lining it with aluminium foil and lightly greasing it. Thread the chicken pieces onto the skewers, while alternating with the peppers. See the pictures on how to properly thread the chicken so that it does not fall off the skewers. Place on the baking tray and lightly brush with oil. Bake for 3-4 minutes on each side, until the chicken is cooked through. Alternately, you may also cook the shish tawook without the skewers in a skillet or fry pan. Just cook the chicken in 2 tablespoons of oil for 3-4 minutes, or until it is cooked through. Shish Tawook can be served with pita bread and salad. It can also be served with this delicious Lebanese Rice.